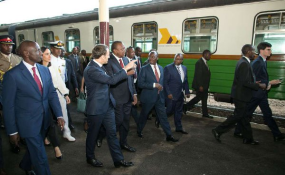 Kenyan Deputy President William Ruto (left), French President Emmanuel Macron and his Kenyan counterpart Uhuru Kenyatta tour the Nairobi Central Railway station during a briefing tour on the progress of the proposed commuter rail service to JKIA on March 13,2019. Kenya plans to build a modern railway line linking Nairobi's Jomo Kenyatta International Airport and the central business district within two years. "A properly functioning urban commuter rail system and Bus Rapid Transit System in our cities, and particularly here in Nairobi, will transform the lives of millions of urban dwellers as well as make Nairobi a wonderful experience for tourists and visitors," President Kenyatta said. "Our target is to have 500,000 urban commuters moving freely daily within the next 12 months. This number will grow to over a million commuters daily within the next five years." In 2012, the World Bank approved a $300 million loan towards Kenya's National Urban Transport Improvement Project, which sought to develop new mass rapid transport systems to reduce traffic congestion in Nairobi and other major cities.